The clue to the state of Armenia’s civil aviation industry can be found in Equatorial Guinea, where six Armenian pilots are expected to stand trial shortly, accused of spying and plotting a coup d’etat. The pilots deny these charges, and the Armenian government claims that they were in the area for perfectly innocent reasons. Foreign ministry spokesman Gamlet Gasparyan said that dozens of Armenian pilots are being forced to find work in Africa because the state aviation company Armenian Airlines, AA, has been declared bankrupt and is facing a Russian takeover. The company’s management now has just over a week to present a recovery package to the Armenian economic court by June 12, or it will face certain liquidation. Opposition politicians and industry analysts are furious. "Smart operators from the aviation industry with government support have ruined a whole strategically important sector of the economy,” said Dmitry Adbashyan, a former AA director, who now runs the National Aviation Union. Most of the company’s employees have since lost their jobs and income. According to Marietta Kazaryan, head of the airline’s legal department, the number of company employees has dropped from 1,500 to 100 people. "Of the 300 members of the flying team, only around 30 have secured jobs with different airlines; the rest are looking into opportunities abroad, " said Kazaryan. For many pilots, this could be the end of the road. "I am too old to change my profession and start again from scratch, but I am too young to retire," said 51-year-old pilot Genrikh Pogosyan. According to Arsen Avetisyan, general director of AA, the company owes its staff ten months’ wages – around 250,000 US dollars in all. “The court has decided that debts will mainly be repaid after the company property is sold,” he told IWPR, adding that the exact scale of the firm’s debts would only be made clear when the liquidation process begins, but it is estimated to be between 12 and 30 million dollars. Some opposition figures are alleging that the bankruptcy has been deliberately planned. "Since 1998 the authorities have been carrying out a policy of artificial bankruptcy for AA,” claimed parliamentary deputy Tatul Manaseryan. “Debts have mounted up so as to artificially lower the price of this company, which many people want to get their hands on,” he added. Justice minister David Harutiunyan rejected this charge, but did concede that there had been “serious mistakes in the company management”. 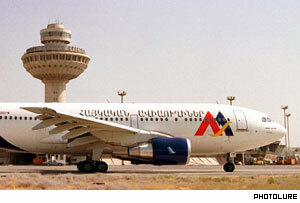 Armenian Airlines was founded in 1993 and given the status of national carrier. The company inherited highly qualified staff, a mass of equipment and 23 planes. Former director Adbashyan said he had drawn up plans to make the airline, as well as Zvartnots airport and the state-run refuelling company GSM, commercially competitive. But he was sacked and his programme was not implemented, something which he said “pushed civil aviation towards collapse”. Trade union leader Garik Mkrtchyan says that a heavy blow came with the transfer of Zvartnots airport to the management of Argentinian businessman Eduardo Ernekian. According to an agreement signed at the beginning of 2003, Ernekian pledged to invest up to 100 million dollars in reconstruction and development of the airport over 15 years. But in practice, almost immediately after it took over the management, Ernekian’s company increased prices on fuel, plane parking and ground service. AA has also suffered from having 15 general directors over the course of a decade, most of whom were not industry specialists. "General directors who presided over mounting company debts were replaced one after another, but no one was sacked or made to answer for this,” AA manager Ashot Berberyan told IWPR. In March last year, the Armenian government took a decision to transfer ownership of AA to the private Russian airline company Armavia. After nearly 70 per cent of Armavia’s shares were sold to another Russian company, Sibir-Avia, that company then took a controlling stake in AA. Opposition politicians are outraged. “Armavia cannot be the national carrier, as the controlling shareholding belongs to Russian business, and the rest of the shares belong to a Russian citizen,” said Manaseryan. Another deputy, Grant Khachatryan, believes that the takeover threatens the sovereignty of landlocked Armenia, which has two closed borders because of the Nagorny Karabakh conflict.